Master luggage maker Louis Vuitton Malletier founded Louis Vuitton on the Rue Neuve des Capucines in Paris, France. He specialised in the craftsmanship of rigid cases and canvas covered wooden steamer trunks. Louis Vuitton realised that round shaped luggage took up lots of room during transportation and went about coming up with a solution for this. He designed and manufactured a range of luggage which was flat and not round. This new design could be stacked and therefore took up less room when customers were travelling. During this period horse carriages, trains and boats were the leading method of transport, so Vuitton’s flat designed luggage took off. Craftsmen then begun to imitate Vuitton’s new signature luggage style. A trunk in a beige and red striped canvas, named the trianon canvas pattern was introduced. Unfortunately this design proved to be easily copied by competitors. To make it harder for counterfeiters, the trianon canvas was updated to a beige and brown colourway and named Rayée Canvas. Louis Vuitton went on to create and trademark the Damier Canvas pattern for its range of luggage and trunks. 100 years on from it launch, the Damier Canvas pattern was reintroduced as the Damier Ebène. When Louis Vuitton died his son Georges Vuitton took over the company, with his vision of making Louis Vuitton a bigger global brand. 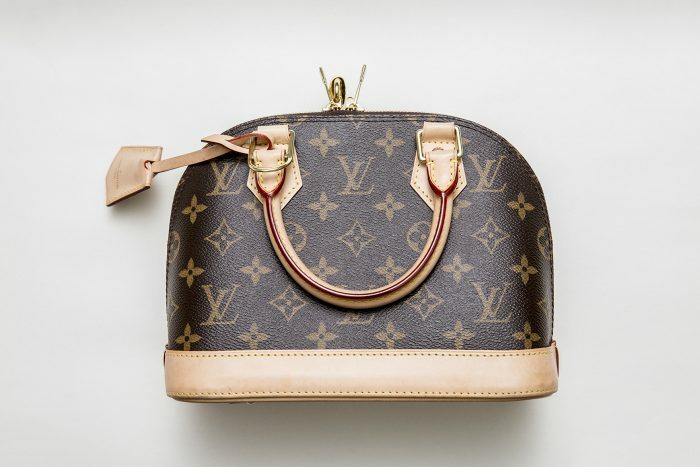 In order to deter counterfeiters, Georges Vuitton created the iconic LV Monogram Canvas. Typically in a brown colourway with Louis Vuitton’s initials, diamonds, circles and flowers printed on coated canvas. Louis Vuitton launched the Keepall, also known as the Tient-Tout (Hold-All). A more portable version of the Keepall, the smaller Speedy style was launched, as a reaction to the faster-pace of travel. First called the Express and later renamed the Speedy, it was first made available in three sizes: 30, 35 and 40. It was the iconic actress Audrey Hepburn herself who requested an even smaller version titled the Speedy 25. This is definitely a key moment in the history of Louis Vuitton. The Noé bag was created as a stylish way to carry champagne, so picnics the world over now have a lot more fizz, thanks to Louis Vuitton. The original Noé bucket style was designed to carry 4 bottles standing up and with a 5th upside down in the middle. Louis Vuitton introduced its first leather line in 1985, when Epi Leather was created and became its first permanent collection of Leather bags. This is the year that saw the merging of Louis Vuitton with Moët et Chandon and Hennessy, thus creating the world’s largest luxury conglomerate – LVMH. In the history of Louis Vuitton so far, the brand had focused on its accessory offerings. This all changed in 1997, when Louis Vuitton launched it’s foray into women’s wear with its first ready-to-wear line, as masterminded by the newly appointment creative director Marc Jacobs. Jacobs stayed on as creative director at LV until 2013. Jacobs pioneered artist collaborations with luxury brands, by working with Stephen Sprouse who created the infamous graffiti Louis Vuitton print which adorned its monogram keepalls and luggage bags. A move which arguably saw art take the form of wearable pieces. Louis Vuitton has continued this trend by working with artists such as, Takashi Murakami and Yayoi Kusama on limited edition handbag collections. Louis Vuitton created the Neverfull bag, as a larger tote style, able to carry all a modern woman’s essentials. The Neverfull typically comes in Monogram, Damier Azur and Damier Ebène coated canvas. This style went on to become one of Louis Vuitton’s most successful styles, marking a key point in the history of Louis Vuitton.